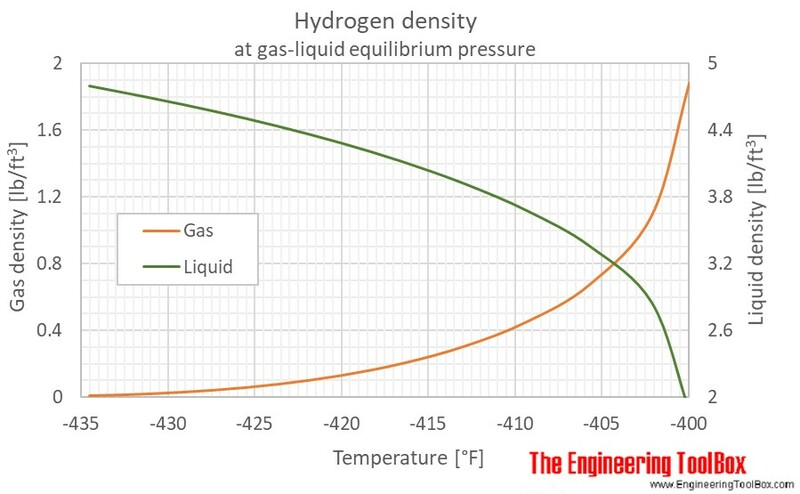 Tabulated values of hydrogen density at given temperature and pressure (SI and Imperial units) as well as density units conversion are given below the figures. 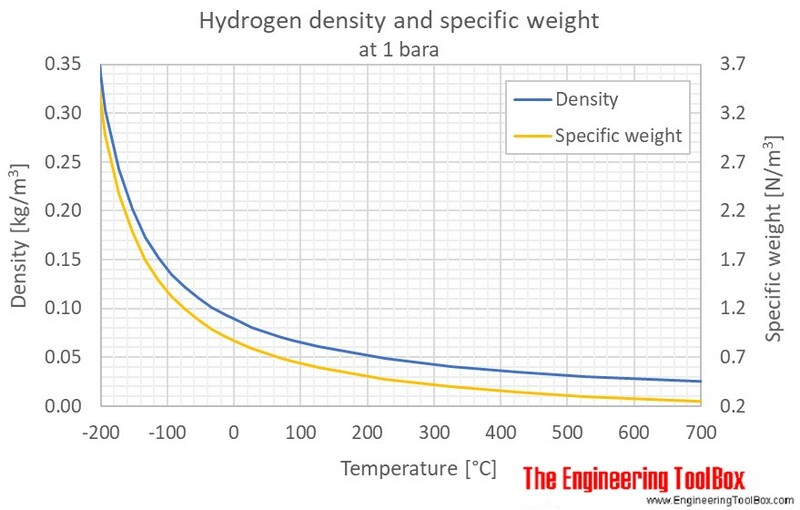 The calculator below can be used to estimate the density and specific weight of gaseous hydrogen at given temperature and atmospheric pressure (1 bara/14.5psia). For calculation of density at higher pressure (up to 100 bara / 1450 psia), a good approximation is to multiply the density at 1 bara with the actual, higher pressure (in bara). If pressure is given in psia, you have to multiply the density at 14.5 psia with the actual higher pressure (in psia) and divide by 14.5. Note! For pressure between 20 and 100 bara, the error may be up to 7% by using this approximation (higher error, the higher pressure). Example 1: Density of hydrogen at 5 bara and 24 °C. Example 2: Density of hydrogen at 725 psia and 125 °F. See also other properties of Hydrogen at varying temperature and pressure: Specific heat (Heat capacity) and Thermal conductivity, and Thermophysical properties at standard conditions, as well as density and specific weight of acetone, air, ammonia, argon, benzene, butane, carbon dioxide, carbon monoxide, ethane, ethanol, ethylene, helium, methane, methanol, nitrogen, oxygen, pentane, propane, toluene and water. For full table with Denity and Specific Weight - rotate the screen! Engineering ToolBox, (2018). 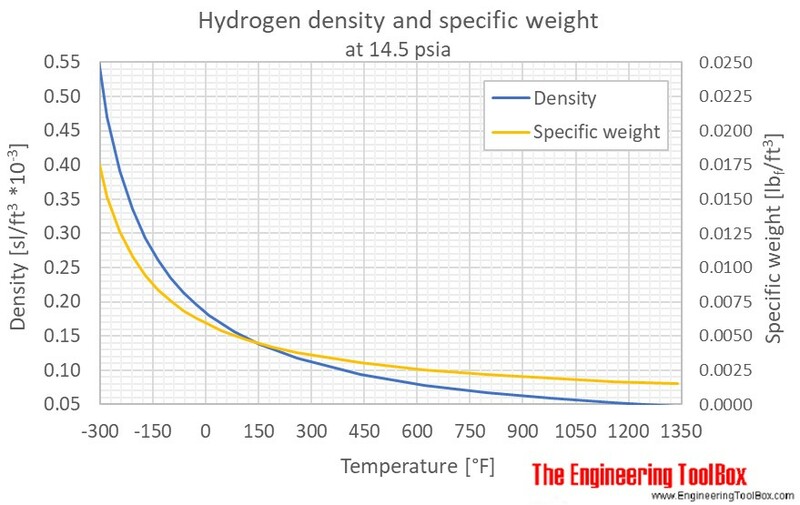 Hydrogen - Density and Specific Weight. 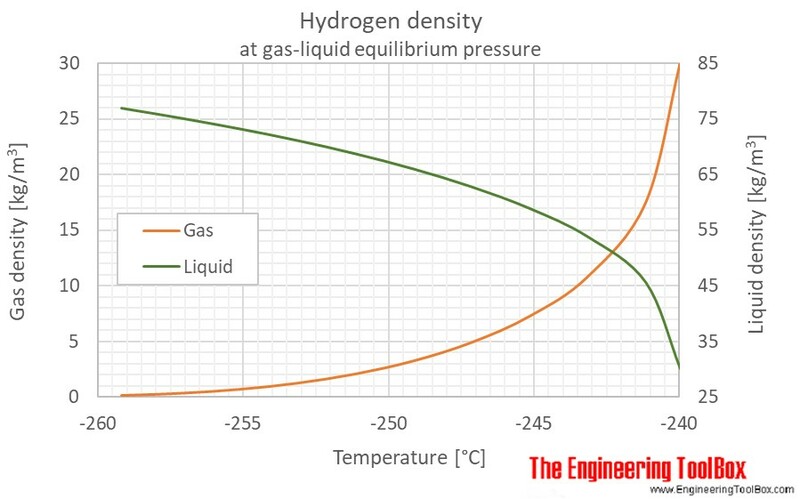 [online] Available at: https://www.engineeringtoolbox.com/hydrogen-H2-density-specific-weight-temperature-pressure-d_2044.html [Accessed Day Mo. Year].